Thank you to all who took the time to visit this lovely part of the world to see the Airdrie Boys @ Kirkcudbright. Huge thanks to the the incredibly generous private collectors who made their collections public for this exhibition, the Kirkcudbright 2000 Committee and the wonderful staff and volunteers who helped the Airdrie Boys (John Cunningham RGI and Dan Ferguson RSW RGI) reach new heights and a new audience. 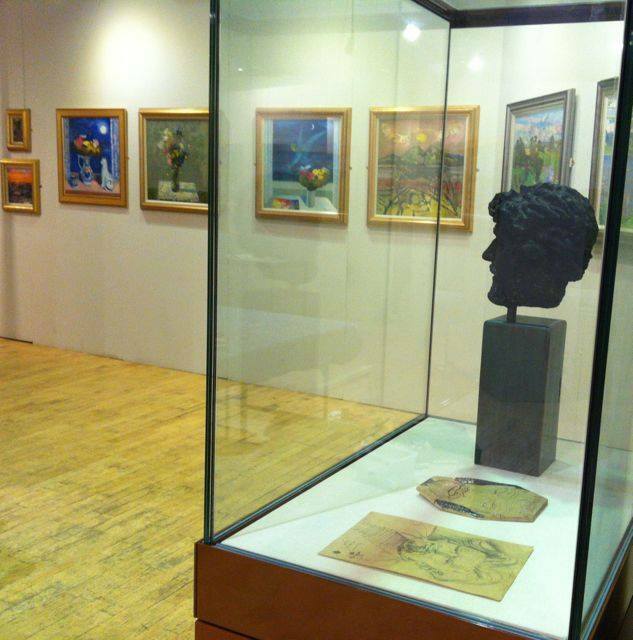 The Airdrie Boys exhibition follows in the footsteps of hugely popular exhibitions such as 'Monet & The Impressionists' and the 'Glasgow Girls' at Kirkcudbright Town Hall. This is the biggest and boldest incarnation yet of the Airdrie Boys exhibition with over 80 artworks on display; all from private collections. Some of the work on show by John Cunningham and Dan Ferguson have never been exhibited before. 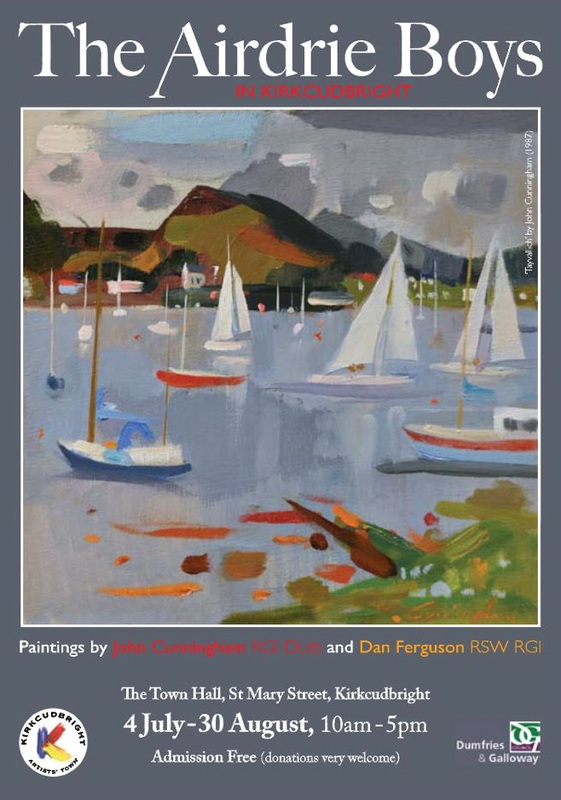 Please support Scottish painting and the sterling volunteer effort of the Kirkcudbright 2000 Committee by visiting this exhibition. One of the challenges facing an artist who chooses to work ‘en plein air’ is finding a quiet spot that both satisfies their aesthetic and creative needs as well as minimising disruption. Many creative people aim to achieve what I call an “alpha state” or what is more commonly referred to as “flow”. It can happen when you are absolutely and totally absorbed in what you are creating; as if, to quote Mihaly Csikszentmihalyi, “existence is temporarily suspended”. I've only ever experienced "flow" through drawing or painting and all I know is that I need peace, quiet and absolutely no physical or mental distractions to enable me to move into a "flow" state. While I’m in this state, I know I do my best work. Which in France is very difficult to achieve because watching an artist work appears to be a spectator sport. Collioure is a magnet for artists (and would-be artists). You can’t walk down any of the popular streets in the town without bumping into somebody painting at an easel or sitting with a sketchpad. My fellow CRM residency incumbent, Frances MacDonald reckoned that the Fauve painters (ie Matisse, Dufy, Derain, etc who really put Collioure on the map in the early 1900s) just stepped out of their doors in the morning and painted the first thing they saw. Having seen some of their paintings and the locations where they were painted, I tend to agree with Frances’ assessment. Luckily for them (and for us), they were all living by the waterfront. Of course, the only spectators at that time would have been the locals and I doubt they would have had time to gawk at the Fauves while they daubed away. Collioure Day 4. The town is already awash with tourists, so it’s a challenge to find locations where I can work without being interrupted. Before travelling to Collioure, I had decided that I wanted to use the month-long residency to draw and I’ll be writing more about the subject of drawing in a later post. It’s the initial stage in my creative process and it also means I don’t have to lug an easel, brushes and paints around. Anyway as it turns out, I spend the first week of my residency just trying to find interesting locations in and around Collioure where I can work in relative peace. By the final week, I am determined to nail the view of Rue Jean Bart; a lovely, quiet tree-lined street, which nestles at the edge of the waterfront. I choose my working spot carefully, sitting rammed up against the long facade of the “Summer Palace Of The Queens of Aragon” looking across the small bay to my subject matter. I’m wedged into a slight corner where the walls of the façade converge at an angle of about 140 degrees, providing the perfect nook for me to work. I start to work with my drawing book on top of my canvas satchel, which rests on my knees. Only I can see what I’m drawing unless any interested spectators are double-jointed. The background chatter of the tourists starts to recede and all I can hear are the waves gently lapping against the shore. I am moving towards a state of "flow"…. until I’m aware of people standing directly in front of me blocking my view and one craning his neck to see what I’m doing. For the next hour, people come flocking up to see what I’m doing, often at great personal discomfort to themselves. No hope of "flow" then but worse, I can’t see my subject matter because of the spectators standing in front of me trying to see what I’m doing! Tell me, if you saw somebody writing in a journal or a diary, would you stand over them watching them write? Do you stand over your colleagues at their desks, breathing down their necks, watching them work? I don’t think so. So why do complete strangers seem to think it’s acceptable to breath down my neck, watching me work? And it is my work, which many people don’t realise. It’s not a hobby or a pastime; it’s my work and this is what I live and breathe for. My drawing books are my own private visual diaries and most definitely not for public consumption, unless I choose to release the images into the public domain. Don’t get me wrong, I am always more than happy to talk about my paintings and my methods to anybody who is interested, but not while I’m working. I just don’t do “performance” art. Apologies to Stephen Clarke for the misappropriation of his book title. I know most of you reading this will be thinking “a month in Collioure, south of France; that’s not work, that’s a holiday!” But here’s the rub; at some point during the next two years I have to put enough paintings together, based on the work that I have executed in Collioure, for a solo exhibition somewhere in the UK. Depending on the venue that can mean anything up to around 70 paintings. That’s not including the preparatory drawings and studies that need to happen before the paintings can even materialize. So Collioure means work for the recipients of the Charles Rennie Mackintosh residency. Collioure Day 3. Now that my cunning plan is in ruins because of my “extreme and irrational fear of heights” (see my "Vertigo" post published 5 June 2013), I need to revise my strategy ... and quickly. I decide that if I stick to walking and avoid driving over the mountains, I should be ok. And let’s face it, I could do with the exercise. So I start to explore Collioure, Port Vendres and the surrounding (low-lying) countryside by foot, which opens up new vistas and generates many new ideas. However a new problem arises – how to avoid the mountains of dog pooh everywhere. I spend more time looking at the pavements trying to avoid the carefully located dog mess than looking at my surroundings. I’m baffled because there are numerous (and free) strategically placed doggie pooh bag dispensers handily situated for dog owners to clear up the mess, but they never seem to be used. The merde really hits the fan when I go to feed the parking meter at Port Vendres and I can’t reach the meter because of the enormous dog pooh situated directly in front of it. While I don’t particularly like paying for my parking, I know the local police in Port Vendres are positively zealous. I have seen them leap out of their Renault Twingo, rubbing their hands in glee at the thought of getting some poor foreign tourist who doesn’t understand French parking regulations. Naturally, I’m irritated by the whole inconvenience of the situation and of course, the inconsiderate owner, but then I think again. 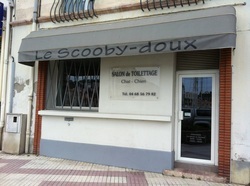 This is France, so there’s a reason why this dog pooh is in this very spot. I remember yet another French “greve” where one of the strikers was being interviewed by the BBC many years ago. He told the interviewer (in excellent English) “ you have to realise that the French never fight for anything, but fight against everything”. In a country which is still highly regimented and laden with bureaucracy, every opportunity to stick a finger up at officialdom is eagerly grasped. This is just another example. I decide not to park my car in the car park, but head off into one of the side streets further away where the parking is free, thus depriving the French state of 2.50 euros. Victory to the people!!! No, not that kind of French letter! I mean the kind that you send with a stamp via La Poste. Like the Royal Mail, La Poste issues books of themed stamps. Stamps still, to certain extent, define a country so it’s with slight dismay that I find Britain to be represented by Dr Who, football heroes, transport, space (? ), Harry Potter and a selection of mostly mediocre royal portraits. On the other hand, La Poste, I think, produces more interesting stamps reflecting the very best of French culture, heritage and even “le quotidien”. Of course you might argue that Dr Who and football heroes do provide an accurate representation of British life …. I had to send a letter to a friend back in the UK and happened upon a book of stamps featuring Cubist paintings. I chose a Braque and a Herbin, the latter because until my second week at Collioure (and to my shame), I had never heard of Auguste Herbin. Collioure Day 13. Rain is forecast for most of the day, so I decide to head off to Ceret to see the museum of modern art there. Several people, including my co-artist Frances MacDonald, have recommended it. Ceret is about 20 miles inland from Collioure, but fortunately still accessible to me as there are no mountains to scale and therefore no acrophobia-inducing roads to contend with. It proves to be a pleasant little market town with the most magnificent art gallery. Most of the massive gallery space is currently taken up with a Herbin retrospective, but there are also some lovely Picasso ceramics in the final gallery. Auguste Herbin was essentially part of the Cubist movement, but in his younger years he toyed with impressionism, post-impressionism and fauvism. 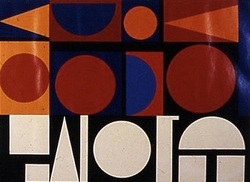 However for me, it was his abstract work that was most stunning and contemporary; the foundation of which was his “alphabet plastique”, a compositional system based on the structure of letters and his work on colour theory. ACROPHOBIA (from the Greek, akron meaning “peak, summit, edge” and phobos meaning “fear”) is an extreme or irrational fear of heights. It belongs to a category of specific phobias, called space and motion discomfort. Acrophobia sufferers can experience a panic attack in a high place and become too agitated to get themselves down safely. Between 2% and 5% of the general population suffer from acrophobia, with twice as many women affected as men. Source: Wikipedia. Best laid plans and all that. Before heading off to Collioure, I sought advice from some of the previous incumbents of the Charles Rennie Mackintosh residency. Go prepared, they said! Have a plan, they said! So I devised a very cunning plan. A friend had lent me Pamela Robertson’s excellent book on Mackintosh’s watercolours from the area. Some of the more remote hill towns looked amazing. Why not attempt to paint from the very same locations as Mackintosh? Collioure, Day 1. I arrive at our meeting point at Le Boulou, about 15 miles from Collioure, to find the hills and mountains disturbingly covered with patches of snow. It’s 25 April and it’s cold with a light drizzle. It is also warmer back in Scotland. There is what can only be described as a vast mountain structure to my right, called Le Canigou. It takes another two weeks to reveal itself in all its glory from underneath the almost permanent cloud cover. At just under 10,000 feet it is simply enormous (well to anyone, that is, who lives in the UK). Undeterred by the ruggedness of the landscape and the inclement weather, I continue to develop my cunning plan, poring over maps and Pamela Robertson’s book late into the night. Collioure, Day 2. Robin Crichton, president of L’association de Charles Rennie Mackintosh en Roussillon and his wife, Flora, take me to lunch in Port Vendres. After a delicious meal, I take up Robin’s generous offer to drive me to some locations in the vicinity which he believes might be of interest to me. All is going well as we chat about this and that in the car, me in the front passenger seat and Flora in the back. Le Racou, Argeles-sur-Mer, Fort Elme, Paulilles all fly by; some locations more interesting than others. Robin points to a dinky white chapel in the distance and manoeuvres the car in the direction of a vineyard track. The chapel, which is inland and surrounded by vineyards, cannot be more than 300 feet above sea level. By the time we get to the chapel, I am in a total sweat, rigid with fear, unable to move and my right hand has left a permanent indent on the interior handle of the passenger door. Sadly I can’t tell you anything about the chapel or in fact anything about the journey back down through the vineyards as I was in such a state of acrophobia. Collioure, Day 3. I have 3 weeks, 4 days left and my plan is in tatters! I have no plan B, or plan Z for that matter…. Do You Still Paint ? to quote Stan Bell, “ an open door to an unknown universe ”. never the same! Always varied, always taking me to different and sometimes new places even though I may not leave the studio. If I’m not outside drawing, I’ll be in the studio most days. A painter’s life can be a solitary one, however I love the seclusion and find that I produce my best work with no distractions or interruptions. I’m inspired by many people from different creative spheres, however I confess a small bias towards fabulous Scottish painting. My “heros” include Joan Eardley, Tom McKendrick, Duncan Shanks, Barbara Rae, Sandy Murphy, Alexander Goudie and Ken Currie. I’ve never been inspired by the Scottish Colourists, but have great admiration for the Glasgow Boys, in particular George Henry and James Guthrie. I paint subjects that visually stimulate me, so I don’t tend to focus on any particular type of subject matter. Different things can trigger my interest; it can simply be the juxtaposition of shapes in a landscape/interior, or several colours working together creating a synergy that offers a starting point for a painting or a series of works. The colour, the marks and the paint quality are all just as important to me as the initial appeal of the subject matter. That’s a difficult one! Scotland is a fantastic place to paint because of the light. I’ve produced work from different areas in Scotland, from the islands to the east coast, but I think on reflection it would have to be the south Ayrshire coast. Having been brought up in Prestwick, I have happy memories of living by the sea and I also find the landscape visually interesting. I’m hoping that I haven’t produced it yet! There are no particular colours that I’m drawn to as I prefer my subject matter to determine the palette. However, I do try to use colour in an intelligent way by making colours work harmoniously together and perhaps in a more tonal way than before. I’ve changed my palette over the years, reducing it to a number of basic colours that enables me to mix all the other colours that I need. This allows me to create much richer and more subtle colours. Regardless of the medium, I always use the same palette. Difficult to say, because I haven’t seen the work of every living painter and there are far too many painters who I admire to list here! by trying to deal with things that might interrupt or disturb the creative process, so that's paperwork, phone calls, emails etc. Once those obstacles are out of the way, I can focus on painting.